Down to 2BB three players from the money, blinded down to 7,000 chips before he doubled, Timon Rooney made Day 2 of the Main Event with 5BB. He's been all in multiple times but he just won't hit the rail. 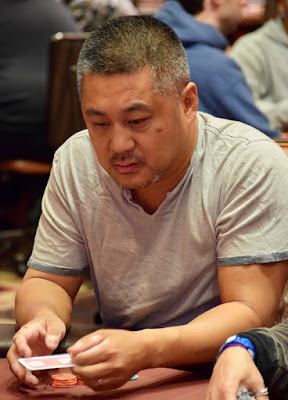 He slid back down to 7,000 chips again and doubled all the way back to 2BB. Next is a 3-way all in that ends in a chop, now there's a 4-way all-in with Timon holding Ten_Seven, flopping open ended and rivering a straight. He's ALL the way up to 7B now.